What's For Dinner? The Options For A Fast Answer Multiply : The Salt As many as 80 percent of Americans don't know what's for dinner by 4 p.m. that same day. From in-grocery store restaurants to local, organic cafeteria fare, new options for fast meals are cropping up. 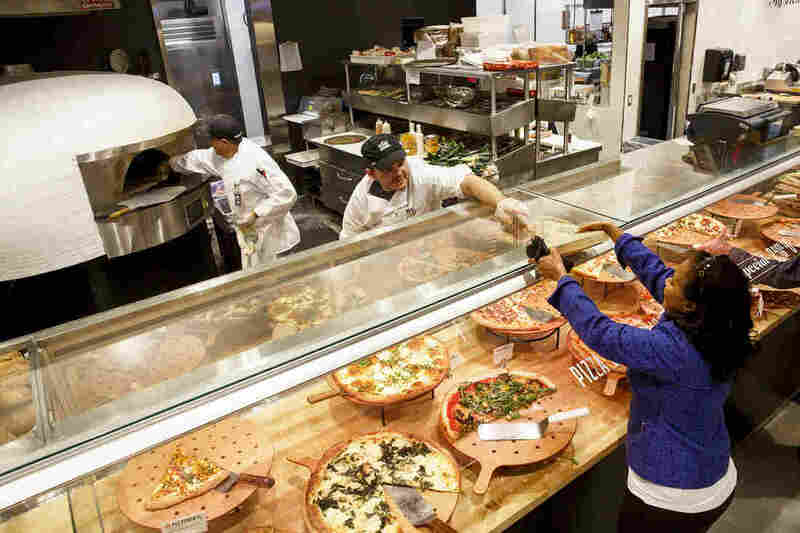 A customer receives a slice of pizza from the prepared food section of the new Whole Foods Market Inc. store in downtown Los Angeles. Prepared foods sold at supermarkets, big-box and convenience stores are a bigger and bigger portion of those companies' profits. When I was kid, "What's for dinner?" was not a question you asked at the last minute. My mom, Dorothy Glinton, was an expert at planning what she would put on the table. "I always knew what I was going to cook. I didn't come in running," Ma recalls. But these days, even she eats out a few times a week. "But I don't go to a restaurant in the evening," she told me. "I do most of my eating in a grocery story right now, picking up a hot soup, going to a salad bar." As The Salt has reported, grocery stores aren't just offering prepared foods. Some are even offering full sit-down experiences inside — what Bonnie Riggs, a restaurant industry analyst for the NPD Group, calls the "groceraunt." According to the food data company Food Genius, as many as 80 percent of Americans don't know what they're having for dinner by 4 p.m. that same day. Groceraunts are just one of dozens of new options Americans have to help figure out that evening meal. Those who crave home-cooking but don't have my mom's meal-planning prowess can turn to online services like Blue Apron, which delivers everything you need to make dinner — ingredients and recipes. Of course, those who'd rather not faff around in the kitchen don't have to. There's food trucks, takeout, drive-throughs, or delivery ordered through one of many, many apps. Even old concepts like the cafeteria are getting revamped. Recently, I visited Picnic L.A. in Culver City, Calif., with Eliot Silver and Noah Ellis — two restaurant guys who used to own a fancy-pants restaurant in Beverly Hills called Red Medicine. What made them go from running a high-end restaurant to opening what I have to call (no offense, I told them) a "high-end cafeteria"? "Same reason we opened Red Medicine," Ellis said. "We wanted to open a restaurant we wanted to eat at." Picnic L.A. is a new type of restaurant that didn't exist a few years ago. But it, too, faces new competition in the "fast dinner" space, as companies like Uber and GrubHub team up with restaurants to offer delivery services. "A restaurant operator can get into the delivery business without having to have the insurance, all the liability, all the things associated with it, because they can partner with one of these companies that deliver," Riggs said. "So it is a growth area, both in-home and away from home." As these fast-casual options grow in popularity, visits to traditional fast-food chains are down, says NDP Group's Riggs. Meanwhile, prepared foods sold at supermarkets, big-box and convenience stores are a bigger and bigger portion of those companies' profits. "I think it's cyclical, but it's evolutionary, too," says Silver. "I think people wanting better quality food, that's a forever thing. I think how they have that and the kind of dining experiences they want to have, that's cyclical." An earlier version of this story incorrectly attributed an Eliot Silver quote to Noah Ellis, and vice versa. Silver's first name was also misspelled.